From Goodreads.com Julie Cromwell is a selfish, manipulative, and insecure woman, and those are her good qualities. Her husband, a cosmetic surgeon, thinks it was because when she was a child, her father sexually abused her. She sets up a fake kidnapping to see if her husband loves her enough to pay a million dollars for her safe return. Something goes wrong and she winds up dead. Thus the first plot twist, but certainly not the last. Enter lead detective Karl Larkin and his partner, Ted Cramer. Together they refuse to let sleeping dogs lie. They begin to rattle the skeletons in the family's closets, following promising leads that lead to dead ends. Larkin finds himself breaking his number one rule: Do not get involved with the family you are investigating, and never, never fall in love with your prime suspect. 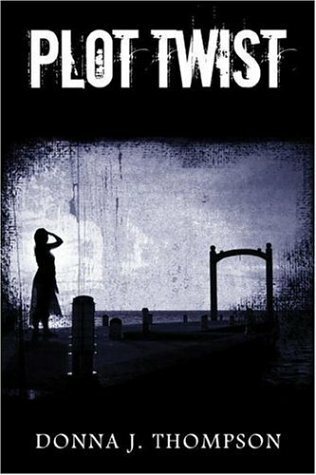 So.. the other day I was browsing the book section of my local thrift store, when I came upon the title "Plot Twist" by one Donna J. Thompson. I was immediately drawn to it as I've had prior experience with her work (Lost Causes: Silent Scream to be exact). After reading the synopsis of the book, I was hoping I would not be disappointed... and I wasn't! Plot Twist introduces (or reintroduces) the reader to Karl Larkin, the same police detective that is in charge of the investigation in Lost Causes. This time however, there was more attention paid to Detective Work, all of the ins and outs as well as the potential problems that arise during a case. This novel was amazing, and definitely lives up to its name! There are so many twists and turns going on that just when you think you've figured something out, BOOM! A new piece of information is learned that completely throws your ideas to the wind. Each of her "main characters", have their own backstories (and flaws), which not only makes them seem more human, but also goes a long way towards explaining their actions (and reactions), to the different scenarios. However, this does not mean that the book is not "easily followed". Even when things seem complicated, it is written in such a way that the reader has no trouble following the line of investigation. This is one of those stories that will draw you in (and keep you guessing) until the very end! A definite "must read"!